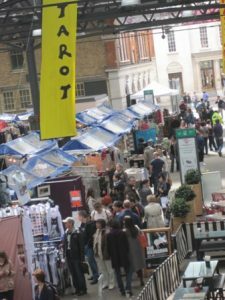 Spitafields Market is an covered market in East London where you can find upmarket stalls with goods ranging from organic vegetables to chic clothing. There has been a market on the site since 1638 when the market was the place to buy fruit and vegetables in London. Nowadays the tendency is for artisan products to be located in the older part of Spitafields Market to the east and the more trendy stuff in the new build section to the west. The facilities are clean and well maintained and there is a selection of good places to eat and drink both within the market and in the surrounding area. The market is open Thursday and Friday from 10:00am to 4:00pm and Sunday 9:00am to 5:00pm.